South Korea’s top Air Force commander will soon visit the United States to discuss the two countries’ alliance and ways to boost defense cooperation between them, Seoul officials said Saturday. 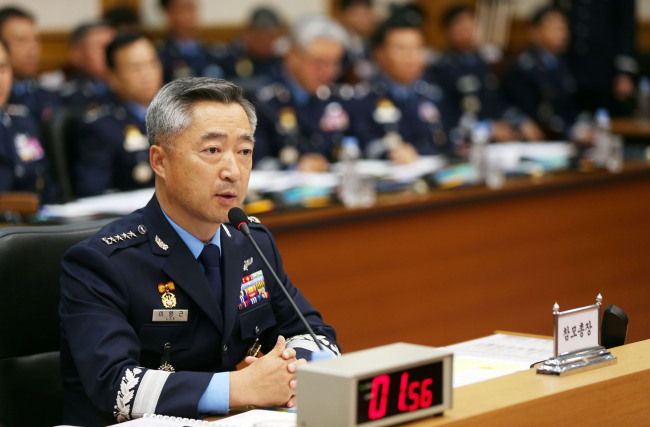 Gen. Lee Wang-keun, the Air Force chief of staff, will start an eight-day visit to the United States on Sunday, having received a formal invitation from his US counterpart, Gen. David L. Goldfein, South Korean Air Force officials said. During his US trip, Lee will visit the headquarters of the US Air Force and US Northern Command and have meetings with their chiefs to discuss the South Korea-US alliance and touch on issues of promoting partnerships between the two sides. In addition, Lee will pay a visit to the Korean War Veterans Memorial in Washington to show respect and gratitude for the fallen soldiers. Lee also plans to go to Luke Air Force Base in Arizona to check on the F-35 stealth fighter jet project the two sides are undertaking. He will give a pep talk to the South Korean pilots and engineers who are receiving training at the US air base.